The pond is teeming with little wriggling black tadpoles. 'They look like baby sperm,' she says, and I divert the conversation elsewhere. I CLEAN the guest bathroom, or at least begin the job. I have lain awake in bed since six a.m., deciding what to do about this month's garden party; which I have left very late. Did you get the message I sent you about the Alfred Franke-Griksch report anomaly on Friday? Or don't you go into work on Fridays! Bankers' hours? Do you have a current address for Brian Renk? Why have the media not picked it up? - A deliberate forgery used at the Treblinka trial! I will go to the PRO later this week and check the original. I am undecided about whether the Facebook logo belongs on the front page of the bookstore. . .
At five-thirty p.m. I drive Jessica, now 16, into Chiswick for her babysitting job. She is such pleasant company. We go for a half hour walk round the grounds before she leaves, and I name to her what trees I can. The pond is teeming with little wriggling black tadpoles. "They look like baby sperm," she says, and I divert the conversation elsewhere. Long phone chat with Jaenelle in the evening. I congratulate her on getting her boyfriend into a job in forestry; now he will have to get up in the mornings, I remind her. I cook a salmon fillet for supper. 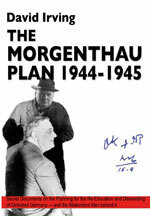 The jacket of The Morgenthau Plan is finished and I upload both that and the content of the book to the printers in Tennessee. JAENELLE has evidently stayed up late, reports on final progress with Irvingbooks.com: "Seems to be working just fine." I compliment our guy in Seattle. "Thanks for doing this --, I can only repeat that we could not have done any of this without you. Jaenelle arrived here [in England] safely yesterday. The first thing she discussed with me was ways of compensating you for your time and effort so far." I REPLY to Kevin's suggestions about deer repellents: "Gardener has suggested Jeyes Fluid and I have sprayed the one budding rose plant with it last night to see how long it survives -- if the plant survives the fluid." Later I add: "Please bring your heaviest jumper cables tomorrow, as I left the car ignition switched on for an hour and the battery did not like it." An anonymous friend comments: "What is happening at The Times? Is it now edited and run almost exclusively by Jews? Oliver Kamm, Harding, Sarah Vine, wife of the Israeli rent boy Michael Gove, Aaranovitch, what a moron, and many others. Their insidious influence is on almost every page, directly, indirectly and surreptitiously supporting other Jews and of course, Israel. Please mention it on your excellent website. Thanks." I reply: "Not sure about Oliver Kamm, but you omitted the really rather droll Daniel Finkelstein." In the evening Jessica hogs the drawing room for over an hour with a fitness video; laudable, but b*ggers up my evening properly. 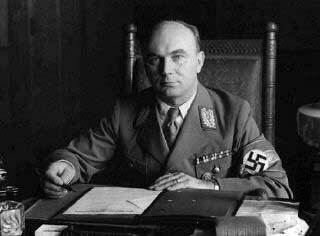 - I am now working even more intensively on Himmler. Unfortunately my only copy of my 1981 book Uprising (publ. Hodder & Stoughton, London) has vanished from the study, so we cannot start preparing the Classic edition yet; Jaenelle goes online and buys another. Quite a warm night. Mark Weber has not replied about the Franke-Griksch report; is he slowing down? Don P. sends an email under the subject-line Sh*tty Little Country Sells Nukes to South Africa: "This will be of interest to you and looks credible, see The Guardian -"
I reply: "South Africans told me [in 1992] that this was the cause that the hybrid 747 cargo/passenger plane went down in the 1980s off Mauritius - a rocket test missile was aboard [in the cargo hold] and began to slow-burn." [The 747 Combi, SAA Flight SA295, went down over the Indian Ocean on November 28, 1987.]. At 9:19 p.m I return from the Public Record Office archives and having dinner with Jessica in the West End. I email this report to Mark Weber at 9:19 p.m. I went to the archives today and found the translation of the [complete] Franke-Griksch report. It seems to have been very recently opened to the public, and there is a second copy in a file I shall go and check tomorrow, even more recent, and it may be the original. I have screened the catalog and will check out the files listed below, perhaps a month-long task. I disagree with you. The discovery that the original Franke-Griksch report does not include the US Lieutenant Eric M. Lipman "extracts" - i.e. that the latter are fake - is sensational. We have photographed about 100 pages from the file. WE have to be back in London with Jessica around 11 a.m. at the Danish embassy to get her (Danish!) passport renewed. All part of being a good father. Tomorrow [daughter] Paloma and Adam come here for a few days. Then we are off to Belgium. At nine a.m. Jaenelle posts this on the Facebook fan page. Working on Himmler, I went to the British government archives yesterday and found the full-length English translation of the "Report by SS Sturmbannführer Franke-Griksch on a journey through Poland, May 4 to 16, 1943". There is a second copy which I shall check today. For sixty years conformist historians of the Holocaust have used a two-page "extract" typed by US Army Lieut. Eric Lipman, with its lurid eye-witness description of mass killing procedures in Auschwitz gas chambers, and lamented that the rest was missing. Lipman's text was used at the Treblinka Trial and by Deborah Lipstadt's "experts" at my libel action against her. Now the Lipman document turns out to be fake. There is not a trace of its content in the original document. It is a concoction. Mark Weber (IHR) thinks this unimportant. I disagree. The discovery is sensational, at many different levels. OUR Canon inkjet printer now comes up suddenly with a message reading: "Error number: 1700. The waste ink absorber is almost full." It seems it is another hidden printer-manufacturer ploy to force you to dump an old, perfectly satisfactory printer and replace it with a new one. (Because the absorber replacement will cost $10, the minimum labour charge is $89.) I download a service manual and go through the procedures recommended to cheat the Canon software. Nuclear war does not break out, so I presume all is okay. I have a private theory that it is the price of ink for inkjet printers that has caused the global economic crisis. If Canon were not so good, I would add them to the junk-heap of printers I have vowed never to buy again, topped by HP - the Handley-Page, as I call it, being of that generation. TODAY [daughter] Paloma and Adam are coming in from Madrid, if the British Airways strike does not halt them. Lincoln H. asks: "Regarding the Franke-Griksch document from Kew, can you elaborate on this for me at all? What does it show or NOT show? I am fascinated." I reply: "I went back to the archives yesterday and confirmed my suspicions, that the 'Franke-Griksch document' introduced as evidence in several war crimes trials is a post-1945 fake, a concoction, and forms no part of the original Nazi document which I have found. I will post these on my website shortly. I would have done it last night, but we have had difficulties with the images." No sign of the new glass table tops we have ordered for the garden tables; and Saturday is our garden party. My right leg is so bad now I can hardly haul myself upstairs - a bitter legacy of the fourteen months in solitary confinement in Austria. AWAKE a lot in the early hours, worrying. Right leg very painful today and it is not at all easy getting downstairs: very gingerly, one step at a time, hanging on to an ancient banister. This rules out a return visit to the PRO today. What a curse. Hey ho. - Jaenelle has typed up the two Rudolf Höss interrogation reports. We drive over to Burnham village to collect the framed pencil sketch of Father by Mother, to give to [brother] John for his big birthday on Monday. The picture-framer looks at my name on the debit card. "There's a famous author by that name . . ." he says. I express polite interest. Any moment now. "I think he denies the Holocaust," he adds. Hey-ho. That Jewish smear really sticks. "He sounds really loathsome," I suggest. Picture-framer nods. "You wouldn't want to be him!" Then on to the glass place, but the two new table tops we have ordered for the garden tables are still not ready. Displeased. They make a phone call and say they will be in tomorrow morning - otherwise Tuesday, too late. Their fax did not arrive at the glass works, they explain. I did not think modern businesses use faxes any more, but say nothing. A CHILLY, gray start for a garden-party day, and quite windy. May have to move inside. Pity, last weekend was gorgeous and warm. Leg today is even worse, and I have to lever myself down the polished oak stairs very gingerly indeed. Mark Weber still pooh-poohs the Franke-Griksch document inconsistencies. Some readers may be happy to overlook Stone's aperçus on 'preachy Indians'. Others may excuse his claim that 'most' Hungarian communists were Jewish (an echo, by the way, of David Irving's long-discredited book Uprising! 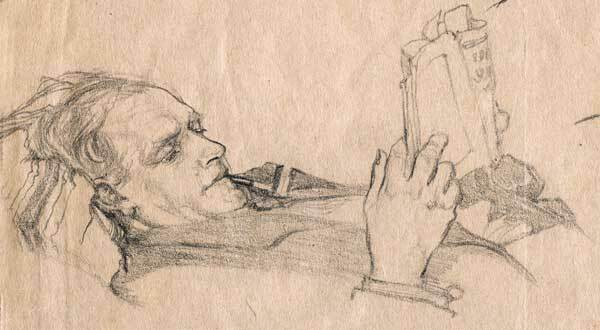 ), or his lively account of events in post-war Romania, where 'there were always Jews' to do Stalin's bidding. They are really touchy, these Jews, especially when it comes to their own inglorious past. As for my book Uprising, by my calculation he was about nine or ten when it appeared, so I would be surprised if he ever read it. Garden party at three-thirty p.m. The summer rain has virtually cleared, and there are brief glimpses of the sun. The house and terrace are packed. The usual trickle of early guests begins around two-thirty p.m. One male guest spends the afternoon chasing Jaenelle, and persuading me that glucosamine plus Vitamin D is what I need. Or avoiding solitary confinement in six-foot square prison cells, I might have added. A pity that this weather-front chooses today to pass through Windsor. 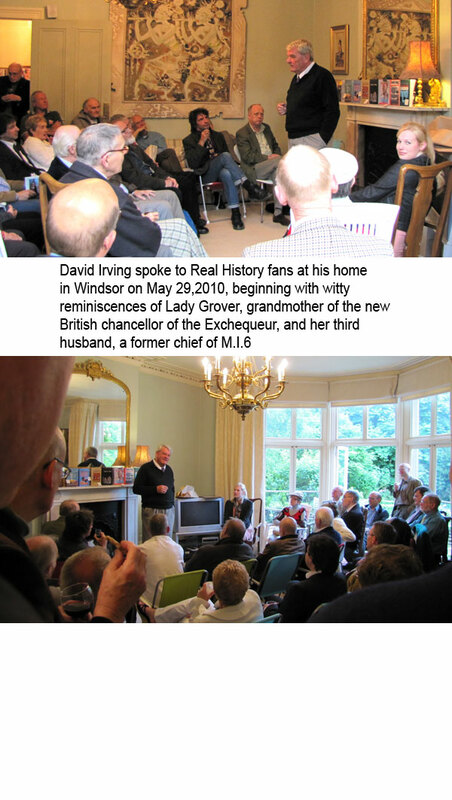 Numbed by medications, the leg pain eases during the afternoon, which enables me to stand for my talk - beginning with fond reminiscences about Lady Grover, her husband Sir James "Ned" Dunnett (who turns out to have been a former chief of M.I.6 - I never knew that at the time we all dined at her house in Kensington), and her lovely daughter Felicity, mother of our new Chancellor, George Osborne. Hugo H.-T., brother-in-law of the current incumbent at M.I.6, tells me he has been officially warned not to have too much contact with that David Irving, which admonition he intends to disregard. Good for him. Some over-salaried and under-witted civil servant playing ultra-safe somewhere, I suspect. As I clear up in the evening a helicopter whirls past, very low indeed, just above the tree-tops lining our paddock. George Orwell, thou shouldst be here now. David Laws has resigned from his three-week old job as Chief Secretary to the Treasury. What a shame - he struck me as the only real man in a Cabinet of old women, but now it turns out he used £40,000 of taxpayer money in a wordily explained but to me still deeply inexplicable pay-off to his (inevitably male) "partner" - to "protect his privacy." Egg all over that nice "Dave" Cameron's face already. I HAVE completed exploiting my yellow index-card series (Judenfrage) for Himmler and find that one of the most important items - quoting a June 1943 report by Gauleiter Arthur Greiser (right) on his fulfilment of the immense killing operations in the Warthegau, which I typed from a long document I found in the Hoover Library at Stanford in 1976, is missing. Since I now find that other yellow cards have white Post-it stickers on them with scribbles like "copy this card," "copy both sides," etc., written by some law-clerk at Mishcon de Reya or one of Lipstadt's "expert historians" during the Lipstadt Trial Discovery, it does not take rocket science to know who filched the item that is now missing. How now to retrieve a copy? Go all the way back to Stanford? I suppose so. WE LEAVE for John's birthday bash in Wiltshire at eleven-thirty a.m. with Paloma and Adam, as well as Jaenelle, packed into the tiny Skoda, and are back in the house at around nine-thirty p.m. A long day. Quite an amusing one however, as all the cousins etc., are there - the only family member missing being Nicky, the Hermit of the East End. Brother John is . . . very upbeat, and in good humour. Frances (his oldest daughter) is there with her husband who will supply to me his high resolution scans of The Dawnchild illustrations, so we can now also get that book reprint moving. [Daughter] Beatrice is there too, with little Olivia, her daughter whom I last saw aged around one through the foot-square prison pane of the visitors' room in Vienna: they had flown up all the way from Australia to Vienna, and Austria allowed them ten minutes to visit me. The hidden cost of writing Real History. At five, Olivia is the petite image of her mother; very perky and frisky but not really understanding what a grandfather is. Later: Beatrice arrives at the Windsor house with Paloma and Adam and we sit up until one-thirty a.m. retailing family horror-stories - Haiti, Nassau, Hawaii, Mexico City, Niagara, etc., all of which they confirm to each other with loud laughter. Work prevented me from attending ... I am a Police Officer and obliged to be on duty in what is termed as "aid" at various events; the Notting Hill Carnival, the rehearsal for Trooping of the Colour, etc. Because of my job I have to be circumspect regarding any affiliation or support for politics. There is however, a particularly vicious, hypocritical, and hysterical concentration of effort by certain organisations in this country against any politics that are perceived to be right wing. 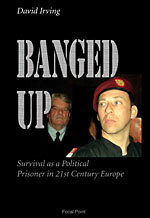 What you recount in Banged Up as having happened to you in Austria could not happen to you here quite yet - but Britain has been heading that way for the last twenty years. I heard of your demonised reputation long before I was able to get hold of any of your books. When I finally managed to buy a copy of "Hitler's War" I didn't know what to expect, but I found it to be a model of Thucydidean objectivity; if I could discern any slight personal bias in it at all it was that you seem to have had a low opinion of the German General Staff. Allowing for my concerns above I will consider attending one of your talks. Meanwhile I shall purchase your DVD to hear what you have to say. I reply, inevitably briefly, to this unusually erudite cop: "Thanks so much for writing that, Mr F.... I have great respect for the police. Though things have changed a lot since a Pc Davies patrolled our Essex village on his bicycle in the 1940s." BEATRICE drives off to London with little Olivia around nine a.m. They will have gone back to Australia before I return to England. We set out for the Ramsgate car ferry at the same time, and we are at the Knokke apartment in Belgium at seven-thirty p.m.. The actual drive is less than a hundred miles. The borrowed apartment is unchanged since 2007 when I stayed here recovering after the Vienna episode. A QUIET day. This is still a very White town. People leave their cars unlocked. The streets are clean, graffiti non-existent. Well done, Belgium. Jaenelle goes out for a reconnaissance of the main shopping street, named after King Leopold - whom Churchill saw fit to smear, after the British betrayed the Belgian Army in May 1940 and "advanced on the Channel Coast." Yes, Dunkirk was the first and only time the English got to the beaches before the Germans. Much work done all day on Uprising! - preparing it for reprinting. My first word-processor book: overweight, but much worked-over. My writing seems to have peaked in 1980. I am enthralled by the quality of the writing, which I shall never attain again; I find I have already forgotten much of what I wrote. I read out loud some of my favourite paragraphs to Jaenelle, and she indulges me and pretends to like them. I go to to bed around eleven p.m., leaving her still hard at work on her laptop. I shall have to buy a new keyboard for this one; it is misbehaving - the spacebar - and very badly worn. 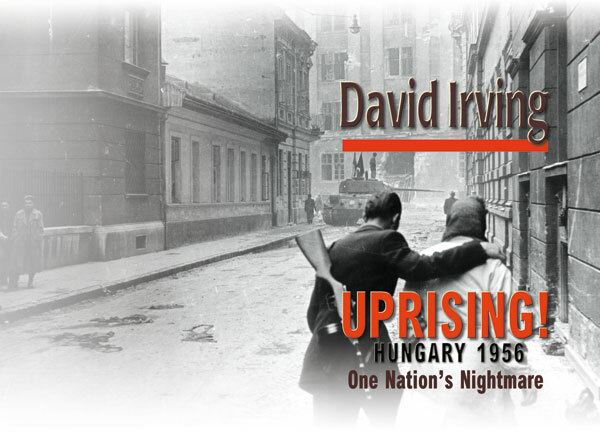 WORK continues on Uprising. We go for a stroll down the very sunny promenade and fork out for an extremely costly lunch snack. This is one expensive resort - but very agreeable. Five-thirty p.m. to the [function location for this evening], where the concierge seems very laid-back, and has no record of our meeting booking. Roland D. comes, a quiet-spoken customs official from Brussels. "I have a young son," he says with a smile, and I remark that History has seen many a famous man who was born the son of a customs official. "Yes," he admits. "I often tell him that. I say, You may make something of yourself yet." It is a strange world. I speak to our guests about using the products of codebreaking in writing history and solving the great controversies, e.g. about Dresden's true death toll. Enough guests buy books during the evening to make it economical to have come here, thus far. The concierge reveals to us afterwards the mystery of the Flemish wording on the parking meters in the street downstairs: they have to be fed only (alleen) on weekends and public holidays - the exact opposite of what one expects. The English text provided is the usual impenetrable word-sludge, which reminds me of Professor Richard "Skunky" Evans and his courtroom "translations". We of course have dutifully paid eight hours a day ever since we arrived. Grrr. Yet another language I shall have to master.